Having been bought up by a one-time chef, it was drilled into me at an early age that convenience food was the work of the devil. At twenty-one, I left home with my Mary Berry's Complete Cookbook tucked under my arm. Two weeks later with a long commute to and from London every day and an oven that had two temperatures - off and inferno, I abandoned the book and embraced cooking sauces with the rebellious air of a teenager with a fake driving licence. My mother was horrified. Over the months, the creation of spag bol went from 'bung some mince in a pan to fry, pour in the sauce and serve' to 'let's just add a bit of garlic and some herbs and a dash of worcestershire sauce' until I was spending more effort getting the flavour right than if I'd cooked from scratch and left out the over-sweet, chemically cooking sauce. Yes, mother - you were right! The blurry bit on the photo is the steam from the rice! But Mary continued to gather dust until recently when she was freed from a dusty pile of cookbooks in an attempt to entice the husband to eat something different. Sunday night in our house is curry night, although last night we had a dirty tea of frankfurters and beans on toast. I have to confess, I usually use Loyd Grossman's Bhuna Sauce because back in the pre-baby days, we used to run together on a Sunday evening so tea had to be quick. Plus the husband does bland, rather than spicy and you can't get much blander than a Loyd Grossman curry sauce. The plan was to make Dame Mary's chicken tikka last night but that fell by the wayside for a number of reasons so unusually for a Monday (my REALLY long day at work) I came home and slaved over dinner. Well saying I slaved is a bit cheaty, but the chicken had to be marinaded for two hours beforehand so it wasn't a quick tea by any means. I knew I was onto a winner when the kitchen was suddenly filled with a proper curry house smell. I just hope it doesn't linger too long - especially as I've got a vendor in at work tomorrow and three huge cloves of garlic were in use in the recipe. It was quite satisfying to make the sauce - the smell of the cumin reminded me of the first time my mum made curry and we had to go to a specialist shop to buy the tiniest amount of cumin as it just wasn't stocked in supermarkets in those days. And it went down well with the husband. A little too hot for his liking - my bad as I couldn't remember if I'd put the pinch of cayenne in so I did another one just in case. But I'm guessing I had done given his watering eyes. Nevertheless, Loyd has finally been banished from our house in favour of Mary, Queen of Curries. Or chicken tikka in this case. Mix the yogurt, tomato puree, tamarind paste, onion, garlic and spices in a large bowl to create the marinade. Toss the chicken in the marinade. Cover the bowl with clingfilm and refrigerate for at least two hours, but no more than eight. 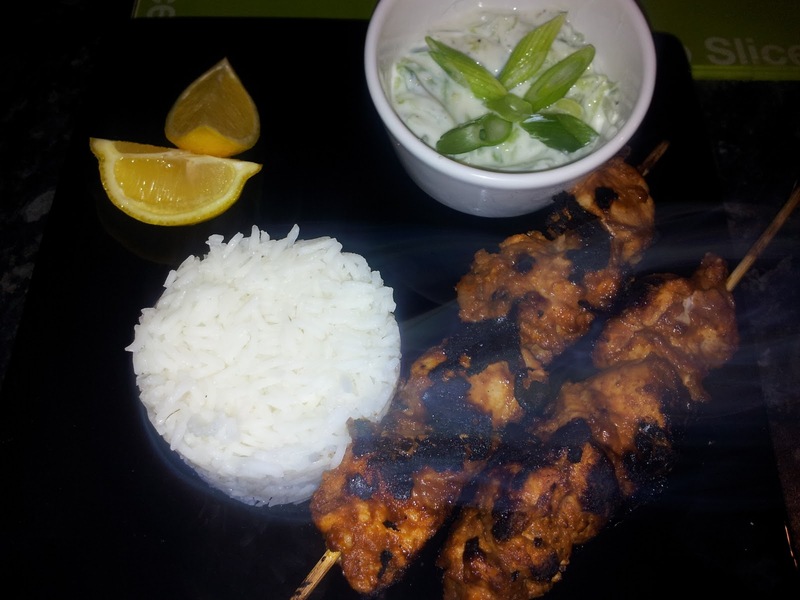 Thread the chicken onto bamboo skewers and cook on a griddle over a high heat for 8-10 mins. Serve with basmati rice and lemon wedges. three spring onions, finely sliced. Grate the cucumber onto kitchen roll or a piece of muslin. Squeeze to remove the excess juices. Mix the cucumber, yogurt and most of the onions, saving some for the garnish. Season with salt and black pepper. Serve garnished with the reserved spring onions.